It’s no secret that most travelers will eventually end up on TripAdvisor when planning their vacation. It has become the Google of the travel world, where people go for honest, unbiased reviews of hotels, restaurants, sights and activities by fellow travelers. Except the information on TripAdvisor is anything but honest and unbiased, and it’s only getting worse. If you’ve only seen the good side of TripAdvisor, be prepared to swallow the red pill. Ignorance isn’t bliss when it comes to vacation planning, especially in expensive destinations like Paris, so this in-depth article will attempt to show you what’s behind the curtain (the summary is first if you just want the main points). The purpose isn’t to rant, but to provide information travelers can use to make better decisions when planning a trip, and to raise awareness in general about how TripAdvisor’s profit-driven practices affect both travelers and small businesses. 1. 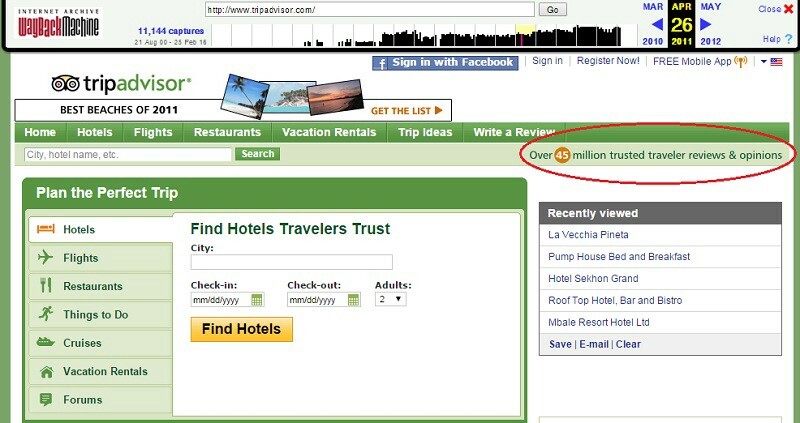 Created in 2000, TripAdvisor built its brand on the trademark “World’s most trusted travel site”. But after countless lawsuits in multiple countries, by 2013 TripAdvisor quietly removed the words “trusted” as well “honest” from all of its website marketing (now it’s just the “World’s largest travel site”). 2. An entire industry of “reputation management” companies exists which businesses can hire to create highly believable fake reviews, “fix” their reputation if they’ve received bad reviews, or sabotage their competitors. To prove how easy this is, an Italian magazine got a fake restaurant that doesn’t even exist to #1 in the restaurant ratings. 3. Even when reviews are posted by honest travelers, there are many good reasons why these are still completely useless to the average traveler when trying to plan a trip (and how spending hours trying to decipher them is a waste of precious time). 4. Hotels which opt to pay for TripAdvisor’s hefty “Business Listing” package get preferential treatment, increased visibility and “access to traffic”, no matter their reviews, rankings and ratings by travelers. 5. 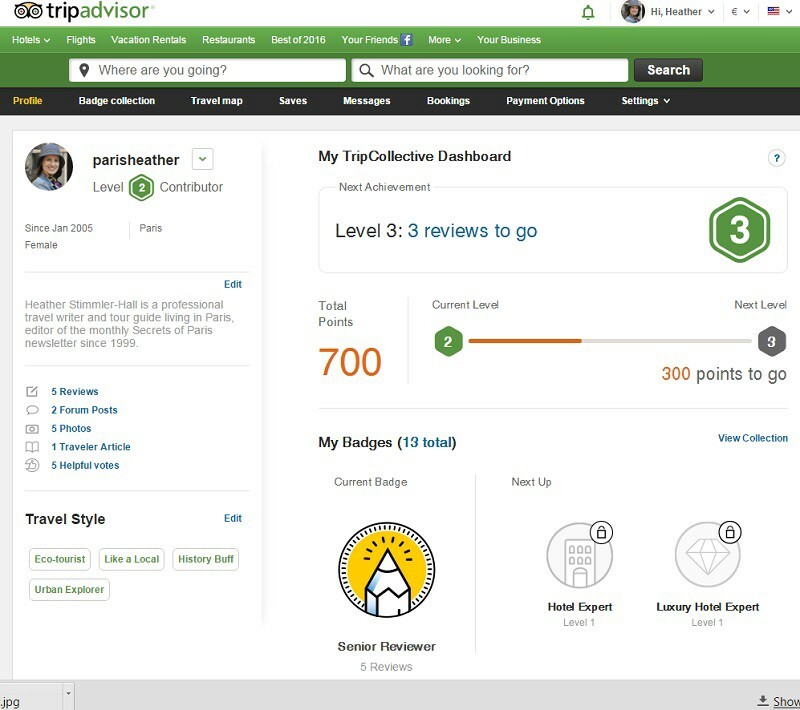 Hotels can’t ask for their listing to be removed, but unless they pay for the pricey Business Listing subscription TripAdvisor removes the hotel’s contact information (phone number and website) from the listing (so users have to go on Google to find their phone and website). 6. Hotels, restaurants and other small businesses can lose a significant part of their business if they receive fake negative reviews or get red-flagged by TripAdvisor for “suspicious activity”, yet they often have no recourse except to take the website to court, and many simply don’t have the financial resources to do so. 7. TripAdvisor prominently positions the tours and activities which can be booked through Viator, a company it bought in 2014, at the top and center of their pages. These companies listed on Viator pay 20–30% commissions. So TripAdvisor is blatantly promoting their own companies’ business listings above companies which are independent, even if the latter have better reviews and ratings by the anonymous users. 8. TripAdvisor encourages travelers to book directly through its own website booking system, but takes zero responsibility for any issues with the service booked when travelers experience problems (ie overcharged on their credit card, show up with a booking confirmation but the hotel has no record, etc). This is compounded when booking through TripAdvisor for tours, because they then go through Viator’s system instead of directly to the actual tour company. The Summary: A complete lack of transparency, follow the money. So to put it all of these points into context, TripAdvisor started in 2000 and built a huge following as a “trusted source of travel information”. Once it gained a dominant share of the market, the number of fake reviews skyrocketed, resulting in multiple court cases around the world. But instead of taking measures to verify and guarantee the reliability of the reviews, they simply changed the “trust” slogan to “the biggest” and began making money as a booking engine, charging companies for preferential visibility, acquiring the booking engines like Viator to profit from the tours they supposedly recommend without bias, and pressuring companies to give up 20–30% of their sales in commissions for added “access to traffic”. The lack of transparency hurts travelers because they think all of the businesses are fairly represented on TripAdvisor, and because their size and power now means they are too big to ignore, pressuring small businesses to work “with” them in order to protect their business reputation. Travelers also don’t realize that when they use third-party booking sites that it represents a serious bite into any business’s revenue, and they make up for that by charging more, so eventually the consumer ends up paying for TripAdvisor’s commissions (whose CEO happens to be the 4th highest paid in the United States). This lengthy article below explains these points in detail, as well as the argument for why even the “honest” TripAdvisor reviews, rankings and ratings are still unreliable and ultimately useless. Part 1 is rather tame for those of you already familiar with TripAdvisor, but the most disturbing and unfair practices by TripAdvisor outlined in Part 2 seem to be news to even some of my travel journalism colleagues. Finally, since I know TripAdvisor isn’t going to go away, at the end I offer some suggestions on how travelers can protect themselves with a more balanced and responsible travel planning process. Everyone is entitled to their opinion, that’s practically the TripAdvisor motto. But I hate one-sided arguments, so I’m going to give you all three sides since I have experienced TripAdvisor over the past 15 years as a professional travel writer, as a business owner of a tour company, and as an independent traveler. 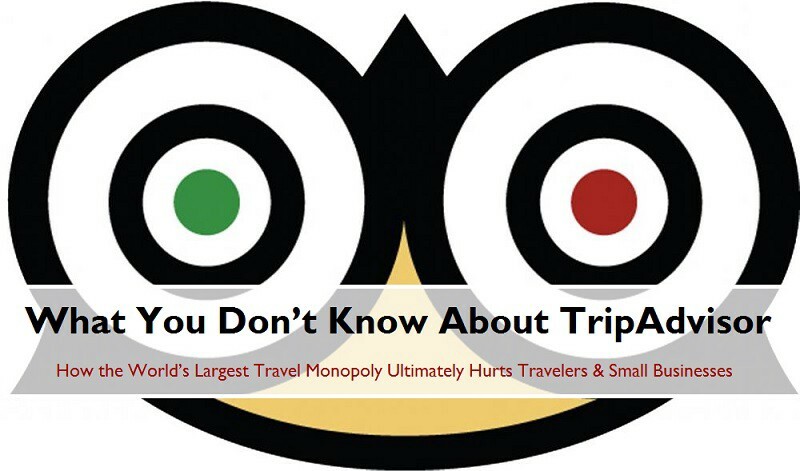 While TripAdvisor may have started as a sort of consumer watchdog site empowering hotel guests, I’ve watched it turn into a greedy travel monopoly profiting at the expense of both travelers and small businesses. Let’s start with the most benign issues of reliability before working up to the ethical ones of transparency and outright lies. No Filter for Ignorance. 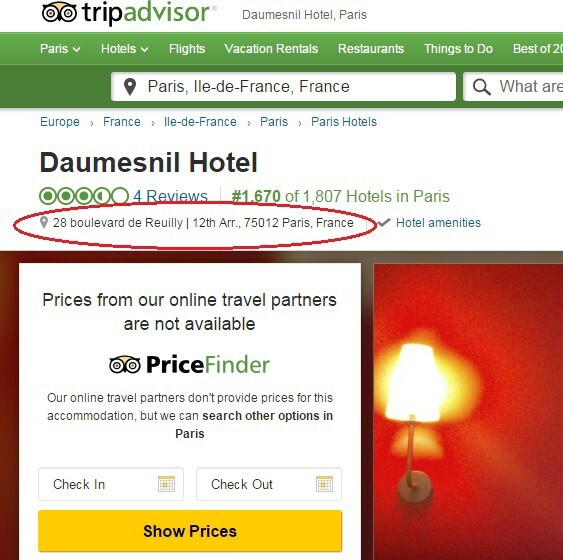 I was just beginning my career as a freelance travel journalist in France when TripAdvisor first appeared on the scene, and I clearly remember the novelty of its user-generated reviews in those early years. But the more I learned as a hotel reviewer visiting hundreds of Paris hotels every year for Expedia and Fodor’s Guides, the more I found TripAdvisor reviews to be dominated by travelers lacking the perspective or experience that would make their reviews useful. Sometimes it’s easy to spot this, such as a review comparing the price of hotels in two totally different cities “Our suite in Las Vagas was twice the size as this one for the same price and the breakfast buffet was INCLUDED!” But what usually gets written is something more ambiguous along the lines of “This hotel is a total rip-off! The rooms are tiny and cramped, and we were charged a fortune for breakfast!” My job as a hotel reviewer was not to say a hotel was the best or the worst (even if I obviously had my own opinions on this), but to accurately describe the hotel in a way that each traveler would know exactly what to expect in terms of size, décor, location and included services, preferably using concrete nouns rather than adjectives. These are the reviews that we all find most helpful on TripAdvisor, because we can relate to nouns, whereas adjectives (and too many superlatives) often don’t communicate anything. Bad reviews are usually a result of a hotel not living up to the guest’s expectations, and ironically it’s usually the rave reviews on TripAdvisor that set up unrealistic expectations in the first place. A skilled travel writer knows that one person’s “cozy” is another person’s “claustrophobic”, but an anonymous reviewer expecting a coffin-sized room might then gush about its spaciousness (luckily most savvy travelers are already suspicious of extremes on both ends and discount those reviews). Unless you’re talking in actual measurements, size is relative, and “relative to guest expectations” is useless when every traveler has different expectations. I think what we really want to know is if the hotel room is spacious relative to other rooms in Paris in the same price range. And only someone who has visited a large number of Parisian hotels would know that, such as travel writers or frequent travelers. Encouraging stereotypes rather than understanding. You don’t necessarily have to be a travel journalist to be qualified to review a destination, but with so much to learn about any one destination it’s no surprise how many of the reviewers probably missed out on some essential local information before traveling to a new place. For example, even the most generic travel guide to Paris covers basic etiquette and local dining customs, yet when I became a tour guide in 2004 I realized a lot of my clients — who are generally well-traveled and conscientious travelers — thought they were getting bad service because they’ve been told “everyone knows Parisians are rude”. All it took were a few shared tips on local customs and etiquette for them to realize not only that their waiter wasn’t ignoring them at the end of their dinner, but also that the secret to getting good service in any boutique or bakery begins with saying “Bonjour Madame/Monsieur” as soon as you walk through the door. That’s not to say you won’t ever run into a genuinely rude person in Paris, but in my experience most perceived slights can be chalked up to benign ignorance rather than malicious intent — from both travelers and locals! Unfortunately it’s easier for all of us to get distracted reading indignant TripAdvisor reviews confirming the “Parisians are rude” stereotype when travelers might be better prepared for their trip by reading advice from actual travel experts whose raison d’être is to help visitors understand and meaningfully interact with the local culture. Without that context, anonymous reviews are about as useful as the scribblings on the wall of a public bathroom. One good apple in the barrel. That doesn’t mean I never scanned the reviews as part of my research, but in the ten years of doing hotel reviews I only remember one time when a series of almost identical incidents recounted in TripAdvisor’s user reviews helped me discover an unscrupulous hotel owner was purposefully overbooking one of his nicer hotels, then claiming there was a flood or other last minute problem with the room to funnel guests into his less attractive property down the road. I may have never discovered this if it hadn’t been for the pattern I spotted in the reviews, but it’s my experience that for every review offering fair, constructive criticism the management can actually address (and some actually do! ), there are twenty more which are useless or absurd. These things make me so angry because even if the negative reviews caught them out, there are real people who had to endure those crappy experiences to save the rest of us (a moment of silence for all reviewers who make that unwitting sacrifice). Why should you have to do all of the work? It’s part of my job to sift through piles of brochures, articles, reviews, personal recommendations, and my own impressions when researching a guide book or travel article. Years of experience now make it easy for me to quickly separate the useful information from the marketing fluff and useless or unfair reviews. But what chance does the first-time traveler have in knowing the difference? I can’t even imagine how exhausting this must be for travelers who just want to have a nice travel experience but end up becoming full-time detectives. I can’t help but think of my own frustration when traveling to new places and I have no real certainty about which reviews can be trusted on TripAdvisor when I have no basis for discerning hyperbole from fact. I know some of you actually enjoy this aspect of sleuthing out the perfect vacation (you know who you are! ), but I for one would love to just be able to read a tourism office brochure and not have the sinking feeling I’m being duped. Is this why so many travelers are now more willing to believe an anonymous review of a restaurant than the review of an experienced travel journalist who can be held accountable for their recommendations and responsible for their opinions? When David becomes Goliath. As a professional travel writer in the digital age, I love how the internet has democratized the industry in a big way, but in killing the gatekeepers we’ve also thrown the baby out with the bathwater. 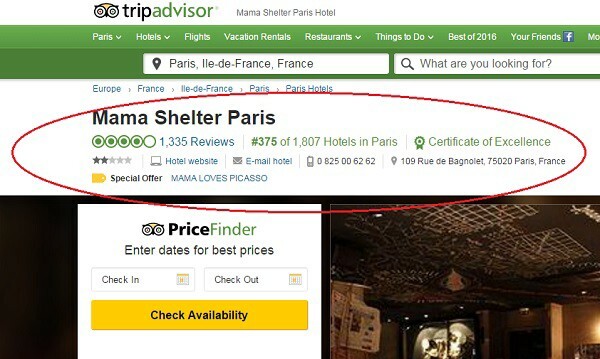 TripAdvisor started out as a much-needed alternative source of information, but has unfortunately become a hulking leviathan giving a disproportionately large and powerful voice to masses of anonymous reviewers spreading unfiltered misinformation and contributing to cultural misunderstanding. And that’s assuming the reviews are honestly written by actual travelers. But we’ll get to that in a moment. There’s a better way of sharing anonymous opinions. Unlike anonymous reviewers, journalists and travel writers know they need to be fair and truthful when writing bad reviews because they can be prosecuted under libel laws for defamation if their claims are unsubstantiated (although there are cases of Yelp and TripAdvisor reviewers being sued as well, with the website owners claiming zero responsibility). Reputable information sources like the New York Times privately verify each commenter’s identity (while allowing them to comment under a pseudonym), and moderate comments, highlighting their top picks of ones they find most interesting and thoughtful. If a newspaper has the resources to do this, so does TripAdvisor. Sites like TripExpert.com are trying to address this lack of zero accountability by consolidating reviews from professionals writing for leading travel publications like Travel+Leisure, Lonely Planet, Michelin, etc. But they are still quite small. TripAdvisor has the resources to do this in a spectacular way by hiring proven local experts in even the most obscure destinations to consolidate the best local information, professional articles and anonymous reviews all in one tidy package that would actually be useful to travelers, and to act as mediators between the reviewers and businesses to avoid any funny business. But TripAdvisor has zero incentive to pay people to improve the site when they’re already making a killing having anonymous people do all of the work for free. Who cares if it’s mostly garbage if you’re raking in the dough? Did I mention TripAdvisor’s CEO earns the 4th highest salary in the United States? If I know what travelers to Paris don’t know (namely, that most of the anonymous reviews are useless), then obviously now when I travel to a new destination I already know I can’t accurately judge the validity of anything I’m reading on TripAdvisor, so I stick to reputable sources of information. For opening hours and prices I’ll go directly to a museum’s own website. For recommendations on where to eat, stay or go out at night I look for articles or blogs written by local insiders (expats from one’s own home country are often a great source of information), and I always look up their credentials before reading their advice. If you’re going to spend hours and days planning your vacation, at least try and make sure the majority of that time is spent researching reliable sources, and minimize your dependence on the anonymous TripAdvisor reviews that give you the false sense of being well-informed and properly prepared. Trusting total strangers over people we actually know. But even if you’re blissfully ignorant about how useless other people’s reviews might be, you know your cousin Louis is a total idiot. You would never take any travel advice from Louis, even if he’s been to Europe a dozen times. So how do you know all of those anonymous TripAdvisor reviews you read aren’t written by him? You don’t. No one has any idea who is writing the reviews. Is it a retired granny living in Florida who loves cruise vacations or a young Wall Street trader who only travels on business with the company Amex card? A Peace Corps volunteer who speaks eight languages or a family just looking for a place where their kids can have a good time? It’s important because it sets up certain expectations, which then affect their reviews. I don’t understand why this doesn’t seem to bother anyone else. Is it because we automatically put ourselves in the reviewer’s shoes as we read, somehow assigning them our own values, tastes, attitude and background? The idea is totally absurd, especially if you take a moment to consider your own personal entourage of friends, neighbors, co-workers and family like the aforementioned Louis. If you tell them you’re coming to Paris, I guarantee almost every single one of them will have an opinion, recommendation, warning, or insider tip they’re dying to share with you. And because you know that person pretty well you will either immediately write it down, or nod politely then dismiss it from your mind. And you think you can do this kind of essential triage when reading anonymous, online reviews? Yet this is what people are doing. Trusting total strangers would be kind of sweet if they didn’t simultaneously disregard their own personal network. I’ve had tour clients recommended to me by their friends, who still double-checked with TripAdvisor before contacting me. My own family members have come to Paris with a list of restaurants collected from TripAdvisor rather than ask me — a travel writer living here since 1995 — for my recommendations (on the plus side, I don’t get any of the blame if they hate it). “Badges? We don’t need no stinking badges!” My own TripAdvisor profile includes my name, photo and website so anyone can look me up, but obviously most people don’t do this. The five reviews I’ve posted over the past decade have laughably earned my profile a “Senior Reviewer” badge (see photo below). They keep sending automated reminders to add reviews and even “articles” so I can get more badges. Oh goody, everyone gets a gold star for participating! I don’t like contributing my free content for websites like TripAdvisor because it then grants all sorts of “authority” to the authors of these anonymously posted reviews, articles and photos with badges such as “Luxury Hotel Expert” or “Restaurant Expert” or “Senior Contributor” purely based on quantity, not quality (I vote to make that the new TripAdvisor motto). We’re not only working for TripAdvisor for free, we’re not receiving any guarantee that any of this information is accurate because anyone can post it and there is zero oversight. And unlike the reviews which can at least be flagged for TripAdvisor policy violations, the travel articles have only one way to interact: “helpful” or “not helpful”. There are no “inaccurate” buttons to press when someone writes that you can skip the line at Notre Dame’s bell towers with a museum pass. Badges are for scouts, not responsible adults. Totally arbitrary “bubbles” and ranking. I probably should have come out of the gate explaining the sheer idiocy of TripAdvisor’s bubbles (aka “stars”, even though they’re clearly round and not star-shaped) and ranking system, but I’m sure those of you who have ever been on TripAdvisor already disregard these totally arbitrary “quality indicators”. First let’s look at those bubbles. When Forbes Travel awards hotels their stars, they are working from a clearly-defined set of standards that each property has to meet in order to get to the next level (and they can see what these standards are and where they fall short). But the mob of anonymous travelers are simply making it up as they see fit. So my idea of what should get two bubbles may be your idea of four. Some properties get three bubbles even when the review says only positive things. So we’re all using the same system, but assigning our own personal meaning and criteria. TripAdvisor averages out the bubbles in your reviews for a general bubble score. If you look up guided tours in Paris on TripAdvisor there are 404 businesses listed. About 50 have no reviews at all, so they are ranked last (#357–404). After that, there are two companies with a 2-bubble rating, nine with a 3-bubble rating, and eight with 3.5-bubble rating. That means there are 337 tour companies in Paris with a 4 or 5-bubble rating. How is that helpful for the traveler trying to choose one? TripAdvisor thinks ranking them is the answer. This is where it gets even more absurd. Ranking is not based on quality. It’s actually called a “Popularity Ranking” because, all reviews being equal in bubbles, those with the most reviews get higher ranking. This means tour operators that churn out daily or even hourly group tours will always have a higher ranking than companies who have fewer clients, and that hotels with more rooms can always outrank a hotel with fewer rooms. There is no adjustment for scale. But to make it look somewhat fair, the second factor computed is how recently each review is posted. So any given tour company can briefly pop up to number one if a bunch of their clients all post their reviews on the same day (by the way, this is how every single book on the planet becomes a best-seller on Amazon, even if just for a few minutes). This of course favors companies who ask (or in my mind, pester) their customers to leave a TripAdvisor review over companies that don’t. It also favors businesses that operate year-round without any break in the low season. How does having one ranking for all tours — where the Hop-on, Hop-off bus tours, Versailles bike tours, free walking tours and private, custom tours like mine are all put into one big category — useful for anyone? Same problem with ranking palace hotels like the Four Seasons and Ritz in the same category with little boutique hotels or youth hostels. Or rankings where burger joints are competing with Michelin-starred restaurants. This doesn’t help travelers make informed decisions. So it’s important to remember it’s a popularity contest, not an equal, merit-based ranking. It just adds more confusion on top of an already shaky foundation of unreliable reviews. Obviously TripAdvisor has no idea what they’re doing. A Tunisian hotel just received TripAdvisor’s coveted “2016 Traveler’s Choice Award” even though it has been closed since last summer when 30 guests were killed in a terrorist attack. Oops. Regardless of everything else written here, the ugly truth is that no one knows which reviews are fakes. So now we’re getting into the truly shady side of TripAdvisor. There have been countless articles and studies done on the high number of fake reviews on their website . How do they do this without getting caught by TripAdvisor’s anti-fraud team? There are companies based in faraway lands where, for a fee, they can expertly game the system to give you good reviews and your competitors bad reviews. And they know how to make the reviews look believable and “reliable”, despite TripAdvisor’s unverified claims that they can spot the fraud. How hard is it to get an IP blocker, pretend you’re a business traveler from New York and after a dozen quick reviews get a silly little “Senior Reviewer” badge that makes you look “legit”. An Italian magazine proved how easy this was by using fake reviews to get a restaurant that doesn’t even exist to #1. Reviews can make or break a hotel, a restaurant, a spa. With the stakes so high, it’s hardly surprising to know many pay for those reviews. Unfortunately some businesses themselves have taken the website to court after being wrongly flagged by TripAdvisor as having “suspicious activity” on their listing. Policing ourselves is a full time job. Am I being an idiot writing this article? As you can imagine after reading this far, I wasn’t exactly happy to see my walking tours reviewed on TripAdvisor, even if every single review has been positive. Maybe tomorrow I’ll wake up to find my business is suddenly flagged as violating some obscure, unnamed TripAdvisor policy. Or five negative reviews will mysteriously appear from reviewers who can’t prove they were ever on tour with me. I’ve already requested the removal of several four and five “star” reviews over the past few years because I know the reviewer was not a client. This is usually pretty easy because they write something like “Loved the bike tour with Pierre!” when I don’t do bike tours, nor answer to the name Pierre, or when the client is from a country where I’ve never had a client. Since I do only customized private tours, I have an email conversation with every single client before a tour is booked, and then have them fill out a detailed questionnaire. I know their names and where they are from, and usually much more than that by the end of a full day tour. So the dude from Morocco who gave me and my “staff” five stars is either mistaking me for another company, or he is a fraudster padding out his profile with fake Paris reviews so he looks like a legitimate traveler. I ask that they all be removed because if/when he gets caught, I don’t want his review on my page. So far two reviews I flagged have been removed. To remove a review a business owner has to fill out a multiple choice form and give an explanation (as if I have time to be doing this), then wait and see. Two other reviews have not been removed, and TripAdvisor gives me no specific reason why. So I use the only power I have to post a “Management response” to let everyone know that although I’m happy for the high rating, they were not my clients and TripAdvisor won’t remove them. If they can produce an email exchange, a PayPal receipt, or any other proof of being my client, they’re more than welcome, but so far it’s just been silence. TripAdvisor pressures businesses into participating. I think TripAdvisor leaves these reviews up just to force business owners to respond. Did you know there’s no way for businesses to opt out of being on TripAdvisor? Anyone can create a listing for a business whether the actual owner “participates” or not. And there is a huge push behind the scenes by TripAdvisor to convince owners that they need to “manage” their page by adding photos, videos, and interacting with the reviewers in order to maintain a high rating, then post the TripAdvisor widgets on our websites and stickers in our windows to promote our businesses. They also ask us for our clients’ emails in order to send them automated emails “reminding” them to submit their TripAdvisor reviews. Just in case you missed that, TripAdvisor asks businesses for your email so they can contact you on their behalf to ask for reviews. Am I the only one who finds it unethical to share my clients’ email without their permission? TripAdvisor markets all of this as “services” for businesses listed on their site, but we’re just really promoting the TripAdvisor “brand”, as if they represent anything other than the anonymous and often unreliable mob at best, and a bunch of desperate or unscrupulous business owners committing fraud at worst. Again, with zero responsibility for anything posted on their site, TripAdvisor wins no matter what happens in their gladiator arena. Accountability goes both ways. I could write an entire article on how ethical it is to allow anonymous reviewers to disparage a business with little recourse. After all, the justice systems of most western democracies are built on the idea that defendants in a court case know who their accusers are. But there have already been many articles about the lawsuits and consumer complaints against TripAdvisor including a 2.3 star ranking on the Better Business Bureau. I would prefer to ignore TripAdvisor, cut out the middleman and just speak directly to my clients. After every tour I send an email asking what they liked or disliked, and what could be improved. Then again, I’m a small business with a personal and direct contact with each client, while the tourism industrial complex which operates in semi-anonymity itself behind its corporate mask probably makes it impossible for a client to complain to anyone who actually cares. But I think it’s important to use your real name when posting a review on a third-party site like TripAdvisor because if you can’t stand behind your words in public, then maybe you shouldn’t be saying them. TripAdvisor knows its reviews can’t be trusted. 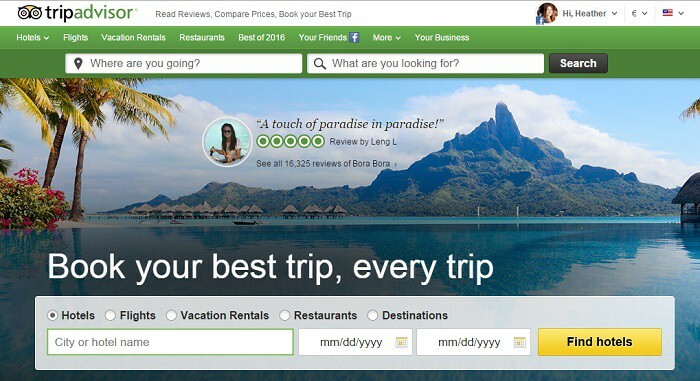 In 2012 they were banned from claiming their reviews are trustworthy after a four-month investigation by the British Advertising Standards Authority, which argued that wording on Tripadvisor’s website — claiming that the site contained “reviews you can trust” and “honest” opinions from “real travellers” — was misleading as Tripadvisor could not prove that the reviews posted without any form of verification were genuine. As a result TripAdvisor had to remove a number of marketing claims from its UK website such as “Read real reviews from real travellers”, “Reviews you can trust” and “More than 50 million honest travel reviews and opinions from travellers around the world”. After being derided in the press for double standards (“Does TripAdvisor believe that trust is a peculiarly British phenomenon?”) they removed the wording from all of their websites. Using the handy Wayback Machine, which takes screenshots of websites throughout time, you can see how the progression of TripAdvisor’s trademarked slogans slowly reveals how the deterioration of trust is matched by their own denial of accountability for trustworthiness. 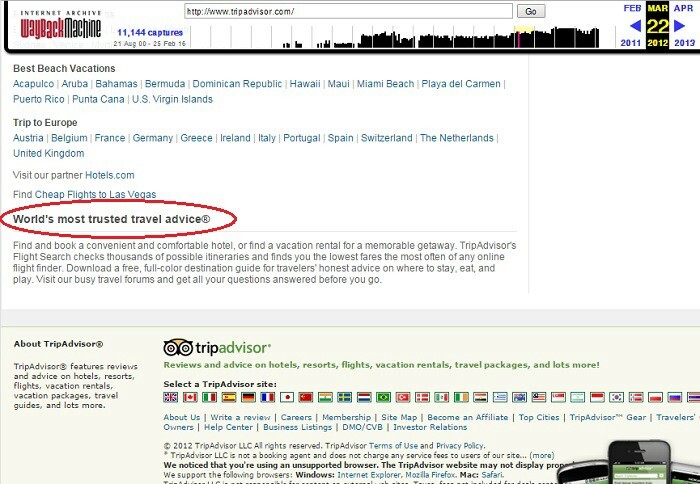 “World’s most trusted travel advice” in 2010, first at the top of the website, then moved down to a discreet location at the bottom of the home page (below). 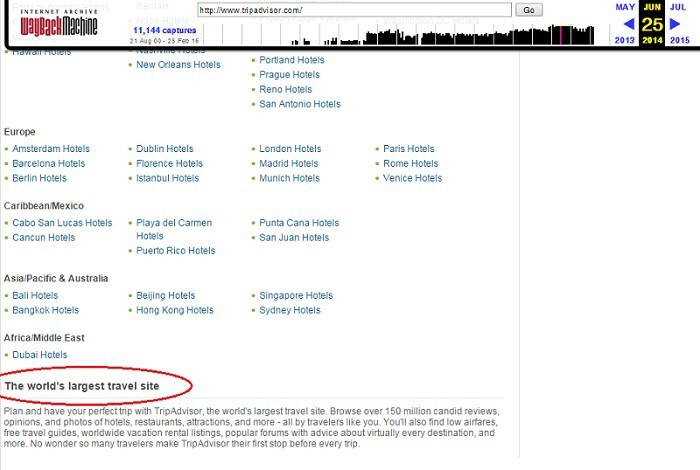 “Over 45 million trusted traveler review & opinions” in April 2011. “The World’s Largest Travel Site” replaced any claims of trust by spring 2013. No sign of any claims of “trusted reviews” on the home page today. Changing the wording allowed TripAdvisor to wiggle out of a €500,000 fine in 2014 by an Italian regulator (the Italian Competition Authority), which called on TripAdvisor to stop “publishing misleading information about the sources of its reviews.” Since they no longer claim their reviews are honest nor trustworthy, they can’t be held accountable for “a few fake reviews”. Now that TripAdvisor can no longer claim to be the most trusted source if travel information, they’ve decided to use their power as the “World’s largest travel site” to squeeze money from businesses who never asked to be on their website in the first place. Did anyone else notice they changed the game? I don’t think TripAdvisor could care less about whether you actually read or trust the reviews anymore. They were just the free bait to get us in the door. While we were busy trying to decipher ambiguous reviews or obsessing about rankings, TripAdvisor used its amassed fortune to buy up every property on the Travel Monopoly board (14 to date, including FlipKey, The Fork, Cruise Critic, and Viator). They now dominate every profit-making corner of the travel industry as the ultimate gatekeeper — or, more appropriately, tollbooth operator — between independent travelers and the companies we’re trying to find. Where once we might have trusted TripAdvisor as a place to find unbiased information about hotels, restaurants and travel services like tours and cooking classes, now they own the booking engines, earning commissions on every transaction through the TripAdvisor website as well as fees charged to companies using those booking engines if they want “access to traffic.” Travelers should know that the hotels, restaurants and travel services heavily promoted at the front and center of any given TripAdvisor page most likely paid to be there, which is a blatant conflict of interest if they expect the user ratings to mean anything at all. Outright lies? “We never have and never will give our advertisers or anyone else preferential treatment.” says TripAdvisor on their Content Integrity Policy page. And yet their own promotional videos state that hotels who pay for a Business Listing fee get preferred placement and “access to traffic” on TripAdvisor as well as their full contact information (website and phone) displayed, whereas those who don’t pay have no information except an address. If a traveler wants actual info they have to Google the hotel’s name to find their website. It’s like paying the mob for “protection”. See for yourself the difference between listings for hotels who pay and those who don’t. The contact information is clearly listed in one, and not the other. But even for those who do pay, TripAdvisor still puts their info in tiny grey print, while their own “Check Availability” booking engine button is bright yellow. Hotels which don’t participate in the booking systems that give TripAdvisor huge commissions have filed a lawsuit claiming that the “Check availability” button on their hotel page says there are no available rooms and recommends other hotels instead. Hotel owners have created websites such as TripAdvisor Watch to reveal what goes on behind the scenes (including blackmail by customers and legal battles with TripAdvisor lost because the hotel couldn’t afford lawyers), but generally hotels, restaurants and other travel industry professionals can’t speak out because they’re afraid of what TripAdvisor can do to their business. So travelers get to anonymously attack businesses with no accountability, but the businesses themselves have nowhere to safely speak out against TripAdvisor. Who is policing the police here? “The Tourism Industrial Complex wants to squeeze as much money out of you as possible, and they are working together to make sure they all get a cut. The ugly truth is that they buy up thousands of tickets in advance and then sell them for 100–300% MORE than the official price. And since there are no tickets left for individuals to purchase on the official website, you’re forced to buy these overpriced tickets for whatever price they’re selling them for. And the even uglier truth is that two companies now work together to make sure you’re getting ripped off: almost every big tour operator sells its tours through the massive tour reseller Viator, which was just acquired in late 2014 by the supposedly unbiased review site TripAdvisor. 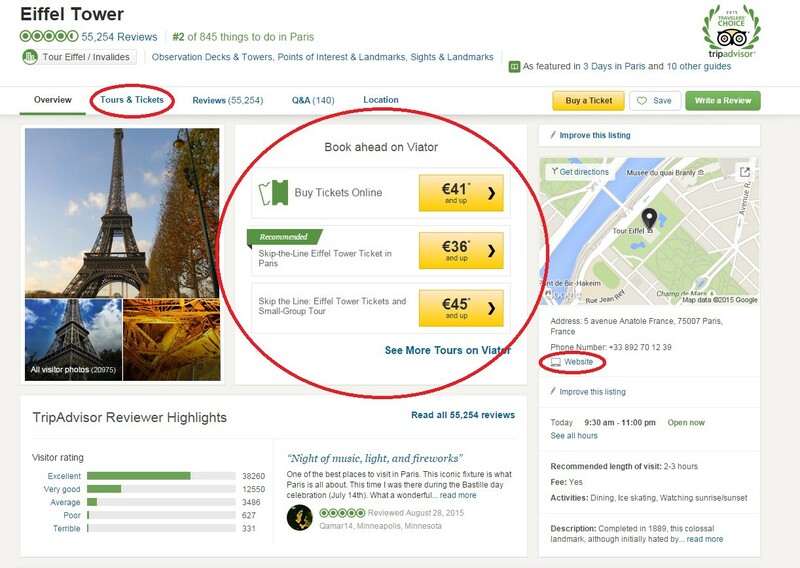 Now TripAdvisor blatantly promotes ONLY the tour companies that sell Eiffel Tower tickets and tours through Viator. 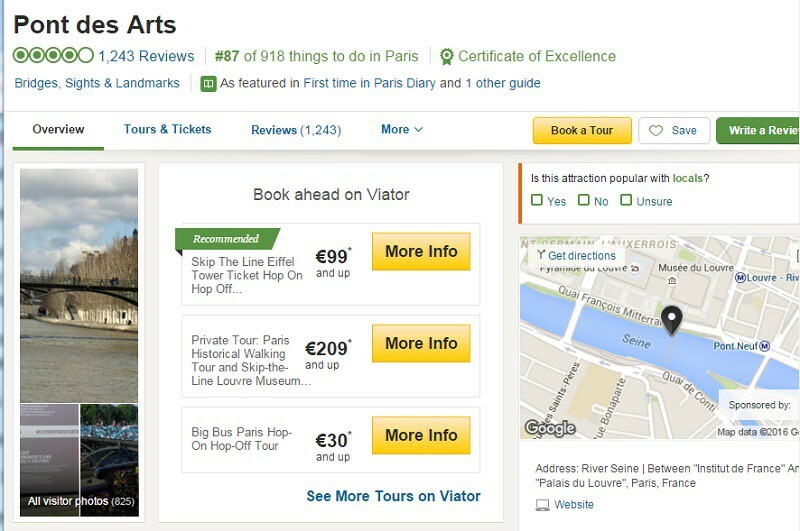 This screen shot below is TripAdvisor page for the Eiffel Tower. The “official link” for the Pont des Arts oddly goes to a publisher’s website promoting a book about the Bridges of Paris. Who did they pay to get that advertising placement? There’s a “partner” link in the source code to CruiseCritic, another TripAdvisor site. This is even more unfair than how hotels are treated, because at least they can have the option to pay to compete with the other hotels. Companies that offer custom, private tours can’t use Viator even if we wanted to, because they only list tours that happen on set dates and can be booked at the click of a button without having any contact with the tour guide. Cookie-cutter assembly line tours love these sort of booking systems because they don’t require any personal contact with the client. Obviously custom tours can’t be booked this way, so our tours are not on Viator and therefore never promoted on TripAdvisor’s Paris pages like the Viator tours. They’re a business, not a charity, right? I have no problem when sites offer value and make money from that. But the money only flows in one direction on TripAdvisor, and the game was rigged from the start to make it almost impossible for a business to refuse to participate, because there’s no level playing ground. TripAdvisor sells itself as a meritocracy where every business is fairly ranked and rated according to trusted reviews, but the companies who don’t pay for a business listing get penalized. And as TripAdvisor has become the largest travel site in the world, travelers are unwittingly using it like they use Google. But Google clearly marks ads, and does not charge website owners a fee for their link to be “clickable” in the search results (uh oh, better not give them any crazy ideas!). TripAdvisor doesn’t support responsible or sustainable travel. Like most mass-market travel companies, TripAdvisor and Viator funnel commissions taken from local businesses out of the local community. So when you purchase a bike tour on TripAdvisor instead of through a Paris-based company, 20% of that payment goes to a corporation in Massachusetts, not to business owners living and working in Paris. Purchasing services from small businesses through booking agencies goes against the basic tenets of sustainable travel. It also results in higher prices overall when small businesses with tight margins have to raise their prices to compensate for the large cut taken by booking agencies like TripAdvisor. Conclusion: So what can responsible travelers do about it? Obviously take the reliability of any anonymous reviews with a huge grain of salt (I know most of you do this already). In the food pyramid of travel planning, think of TripAdvisor as mass produced junk food and keep it limited to a small percentage of your daily intake. Make sure the majority of your travel information comes from trusted, verified sources (where the information is by a travel journalist or blogger with a track record you can check). Whenever possible, book hotels, tours, restaurants, cooking classes or any other travel service DIRECTLY with that business. TripAdvisor knows we’re so busy we prefer the easy one-click option on their site (even if the price isn’t cheaper), but by booking direct you are helping support small businesses (and they’re happier to have you as a client), keeping overall prices down, and cutting out the middleman in the communication and accountability chain in case something goes wrong. If you feel you genuinely have a problem with any service or accommodation, and you have already informed the management of the problem without a sufficiently concerned response (don’t demand to be “compensated” for little issues, that’s just douchy), then consider using your real name when writing a public review. I think it keeps us civil and accountable (which, if we’re going to demand that of these businesses, we should be willing to do it ourselves). There are many other “outlets” for reviews besides TripAdvisor, including Facebook pages, Google, and travel sites or publications which recommended them in the first place. When I worked as a hotel reviewer at Fodor’s my editor always forwarded the letters and emails sent in by readers about their experiences, and I would take them into serious consideration when revisiting a hotel and deciding whether or not to include it in the next edition. TripAdvisor may have given every traveler a “voice”, but it’s up to each of us to decide to use it in a responsible way. Heather Stimmler-Hall is a travel journalist, guidebook author and tour guide living in Paris since 1995. She founded the Secrets of Paris website in 1999. American author and journalist living in Paris since 1995, Heather is the editor of the Secrets of Paris Newsletter (www.secretsofparis.com). After working in tourism since 1999 as a travel journalist and a tour guide, I’ve seen firsthand how the Industrial Tourism Complex takes advantage of travelers, and the media happily play along. But what can responsible travelers and journalists do about it?